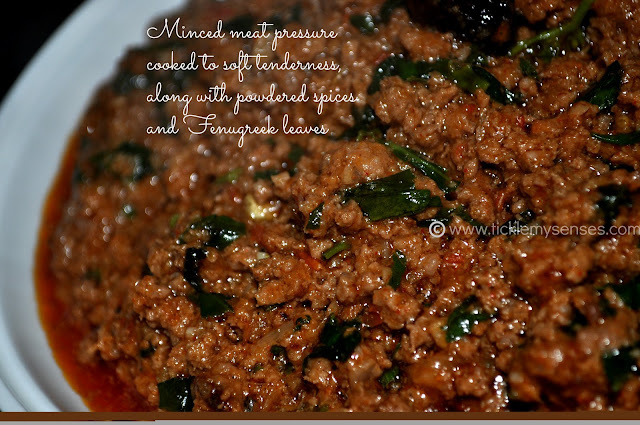 Tickle My Senses: Spicy Lamb Mince Curry with Fenugreek leaves using a Pressure Cooker. Minced Lamb pressure cooked with Whole Spices and Fenugreek leaves to a juicy soft tenderness. Enjoy with rice, parathas or rolled in chappatis. 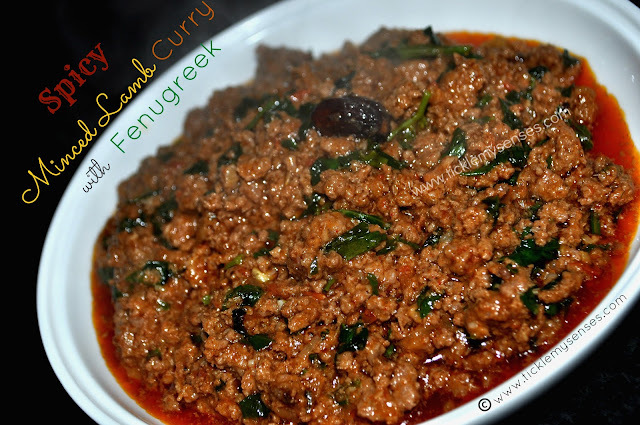 To Make Spicy Lamb Mince Curry with Fenugreek leaves using a Pressure Cooker. Fresh Methi leaves: 1 cup leaves seperated from stem, washed and coarsely chopped. 1. Place a cooker on the fire and pour oil into it. After the oil heats up, add cumin seeds, crushed cardamom pods, bay leaf and cinnamon stick and saute for a few seconds. (Do not allow the spices to burn). Add the chopped onions and green chillies and saute well on low flame until the onions turns light brown. Then add ginger- garlic paste and saute for another 3-4 minutes. 2. Add the chopped tomatoes, chopped coriander leaves, add 1 tsp of salt and fry well till the tomatoes soften and the fried mixture turns into softened pulp with oil oozing from the sides. Add the spice powders and fry for another minute or till aromatic. 3. Add the minced meat, mix well to incorporate the meat well into the masala. Break any lumps. Fry on a medium flame for 5-7 minutes. 4. Add enough hot water to just cover the minced meat mixture by an inch. 5. Close the cooker and place the weight. Cook on a high flame for one whistle then lower the flame and cook on a low flame for a further 10-12 minutes. Turn the flame off, let pressure drop by itself. Open the cooker, add the chopped methi leaves cook for a further 5-7 minutes till leaves are cooked. Adjust salt, squeeze over lemon juice. Serve hot. 1. The methi or fenugreek leaves can be substituted with chopped spinach leaves. 2. The lamb mince can be substituted with beef, turkey or chicken mince. Welcome to Tickle My Senses. Im so glad you tried this recipe out and liked it. Loving your ingenius substitution of Minced meat with Soya and Brinjal. Im sure most vegeterians will benefit by your suggestion and feedback. Thankyou. Much appreciated. I hope you do try out many more recipes and enjoy them too.